This is one of my favorite recipes and I have won Blue Ribbons with it as well I hope you enjoy it as well. Preheat oven to 350 degrees F (175 degrees C). Lightly grease 9x5 inch loaf pan. and brown sugar. Stir in eggs and mashed bananas until well blended. Stir banana mixture into flour mixture; stir just to moisten. Stir in chocolate chips. Pour batter into prepared loaf pan. out clean. Let bread cool in pan for 10 minutes, then turn out onto a wire rack. -This is my banana nut bread don't have a picture of the chocolate chip banana bread since its baking. Mmmmmm! Thanks for the recipe! I love the idea of the mini chocolate chips. Sometimes regular ones are just too big! Thanks for sharing this recipe with Delicious Dish Tuesday! 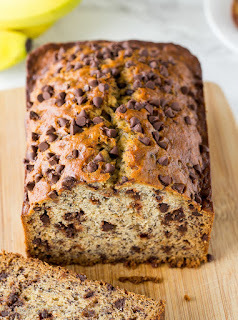 So funny to see this linked up this week, cause I have a post ready to go up with my banana bread recipe! LOVE banana bread, and if you add chocolate chips it's even better!